Choosing jewelry to complement an outfit can be difficult, but it is not impossible. Rings, bracelets, earrings and necklaces can all add beauty and elegance to any outfit, but picking these pieces carefully is important, especially when it comes to selecting a pendant to wear. Pendant size is one of the most important decisions to make, and this can depend on many things – the outfits that it will be worn with, the color of the piece, the overall appearance of the person wearing it, and even the event or functions that it will be worn at. Each of these factors may play a part in initially choosing the jewelry, and should be very carefully considered. A large pendant can draw attention away from other aspects of the appearance, especially when choosing a bight or shiny color. When worn with singular color clothing, a large piece of jewelry will become the focal point of the outfit, and is easily a conversation piece. Larger pendants should be worn with simple necklines and minimal jewelry of other types, and the chains on these large pendants should be carefully chosen, too. Ensuring that the two complement each other is important, as is making sure that each piece does not clash with the overall outfit. Small pendants can be used to make a statement, or simply to tie a look together. Whether adding a small sparkle via a gemstone, or a touch of personality with a figure or specific shape, the smaller pendants can be chosen with a certain look in mind. These can also be worn with more delicate and light chains, which will ensure that the attention is paid to the pendant, not what it hangs from. Many pieces can be worn in many different ways, regardless of the size. Buying a pendant with an adjustable chain can help to make the piece versatile – keeping the chain shortened for an elegant look, or letting it hang lower for a more casual occasion. Just because a piece of jewelry looks nice or catches a person’s eye does not mean that it is appropriate for any setting. Depending on the other people who will be in attendance, some pendants may be more “right” for some situations than others. Using good judgment is an important thing to consider when making a purchase, because depending on the lifestyle of the owner, size for pendants does matter. A pendant’s size should not distract others completely from the rest of the outfit. It is ok to make a statement with one, but the pendant should not be the only thing others notice. The wearer’s hairstyle should be taken into consideration when choosing jewelry, as loose, long hair may tangle in long chains or around large pieces, and depending on the color, small pendants may become lost in the tresses. On the other hand, a large pendant paired with short or pinned up hair will draw attention to the upper body, and a smaller piece may look more polished with a sleek, pulled back but over the shoulder ponytail. Where to Buy a Necklace or Pendant? 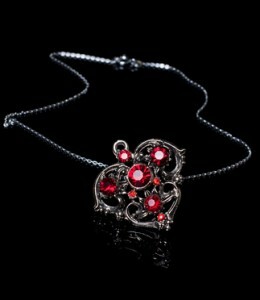 Check out the great selection of necklaces at Amazon. For diamond pendants and necklaces, we recommend James Allen (read review) because you can take a 360-degree look at any stone before having it set in a pendant. Handmade vs. Machine-Made Jewelry: Which Should You Choose?